• Pop. (2000) 1,293,953, a 28.5% increase since the 1990 census. • State Motto: "Esto Perpetua"
"Coeur d'Alene" means "heart of an awl" in French. 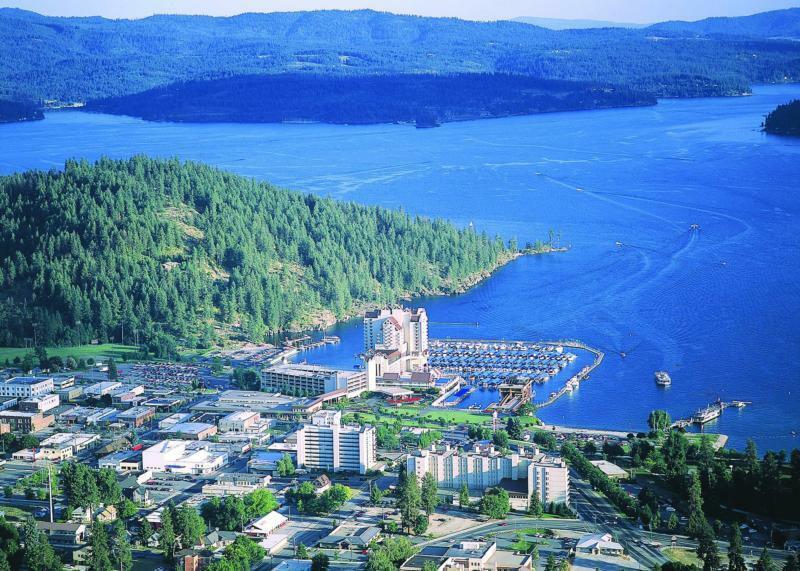 The pristine serenity of the lake And its surroundings has earned Lake Coeur d'Alene a reputation as one of the world's most beautiful sights. Enjoy the friendly atmosphere of the City Beach and numerous water activities, including water skiing, wake-boarding, fishing, jet skiing, para-sailing, boat cruises, seaplane rides, kayaking and more. 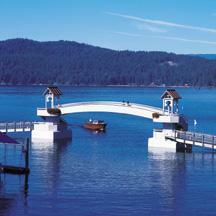 Lake Coeur d'Alene is about 30 miles long and ranges from 1 to 3 miles wide. It has 135 miles of beautiful shoreline and is an average of 120 feet deep. The lake is fed by three rivers: The Coeur d'Alene, the St. Joe, and the St. Maries. The lake flows outward to the Spokane River, which flows west about 25 miles into east central Washington. Originally, the lake was formed by melting glaciers, although the depth of the lake has been increased by the construction of the Post Fall Dam. Historically, the lake was used as the major method of transportation for the lumber industry that flourished in the area. Lake Coeur d'Alee is home to several sunken Model T's that failed the winter drive across the lake. Some steamboats also rest at the bottom of the lake, after being burned when the public no longer used them to ferry themselves across. Divers often visit these sunken treasures, a piece of Coeur d'Alene's history that sits undisturbed. Today, the lake is a major tourist attraction, bringing thousands of visitors during the popular summer months to explore its beauty and vast recreational activities that it offers. Although the summer and fall seasons host warm weather for water recreation, the lake offers its scenic beauty year round with alternative activities in the off-seasons. Wolf Lodge Bay is a very popular place to view the Bald Eagles feed on Kokanee during the winter months. The North Idaho Centennial Trail provides a fully-maintained trail that follows much of the northern shoreline of the lake. The 24-mile paved trail extends from Higgins Point to the Idaho/Washington border, offering a no-fee site for runners, bikers, dog-walkers and the like, year round. Idaho Scenic Hwy 97 is a beautiful drive along the east shoreline of the lake during any season, although the fall colors are an especially spectacular sight. Coeur d'Alene hosts many events that center around Lake Coeur d'Alene, including the Coeur d'Alene Marathon, Ironman Coeur d'Alene, 4th of July Festival with fireworks over the lake, Coeur d'Alene Triathlon and Duathlon, Wooden Boat Show, and more. For thousands of years, almost 5,000,000 acres of what is now North Idaho, eastern Washington and western Montana was the homeland of the Sahlish-speaking Schee-Chu-Umsh. In the early 19th century, when explorers and fur traders began to move into the Northwest, the Schee-Chu-Umsh acquired the French name Coeur d'Alene. Translated "heart of awl," meaning hearts like the point of an awl, the name described their great skills in trading. The Tribe embraced Catholicism on the wings of legend: Coeur d'Alene Chief Circling Raven's vision of men wearing black robes bringing a great spiritual truth to his people. The importance of the Old Mission of The Sacred Heart can't be minimized. Its story is interwoven into Idaho history. It served as a learning center and home for the Coeur d'Alene Indians, a stopover for westward settlers, a haven for the sick, and a supply and post office. Originally built on the St. Joe River in 1842, it was moved due to flooding. The present site in Cataldo, overlooking the Coeur d'Alene River Valley, was selected by Father Peter DeSmet in 1844. Visible from I-90 it is approximately 90 ft. long 40 ft. high and 40 ft. wide. The structure was built by Jesuit priests and the Coeur d'Alene Indian Tribe. Through Father Ravelli's ingenuity, the entire building was constructed with a broad ax and auger, ropes and pulleys and a pen knife. Completed in 1853, it is the oldest standing building in Idaho. It is a national land mark and was designated an Idaho State Park in 1975. In 1853 General Isaac Stevens, the first governor of Washington Territory, came through with a survey party in search of a northern route for a transcontinental railroad. Stevens recommended to the Congress that the proposed route should cross the Bitterroot Mountains and follow the south fork of the Coeur d'Alene River. The 624 mile road, which became known as the Mullan Road, after Captain John Mullan who supervised the construction, was completed in 1862. It served as a military road, as a settler's route, a supply route for the Northern Pacific Railroad, and would provide access to the Coeur d'Alene Mining District. 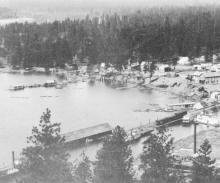 Camp Coeur d'Alene was established at the headwaters of the Spokane River. Fort Sherman was the beginning of a pioneer village that became the city of Coeur d'Alene. In 1898, the entire Fort Sherman garrison was sent to fight in the Spanish-American War. The post was officially abandoned in 1901. Today, the original fort grounds are the site of North Idaho College. The first sawmill in the Coeur d'Alenes was built by the military at Fort Sherman. Rumors about the presence of gold in the Coeur d'Alene Mountains date back to the early 1860s when the Mullan Road was built. Some 20 years later a veteran prospector, Andrew J. Prichard, discovered gold near the North Fork of the Coeur d'Alene River. In 1884 silver was discovered on the south side of the Coeur d'Alene Mountains, near Wallace. By 1890 most of the great silver mines of the Coeur d'Alenes had been discovered. Wallace became the hub of one of the richest mining districts in the world. Over $5 billion worth of metals has been extracted from the Coeur d'Alene Mining District. The Coeur d'Alene Mining District claims many records for silver production: The deepest, the Star-Morning Mine at Burke (7,000 feet deep); the richest, the now-closed Sunshine Mine on Big Creek (over 300 million ounces of silver produced); the biggest, now closed Bunker Hill (over 180 miles of underground workings). Historic Wallace's past is replete with tales of millions being earned and lost, cataclysmic forest fires, mining wars and U.S. Army-supported marshal law, gambling and bordellos. It's the last town listed on the National Register of Historic Places and up until a decade ago, downtown Wallace was the location of the last stoplight on Interstate 90 between Seattle and Boston. The township of Kellogg was established in 1892. Kellogg is named after Noah Kellogg (his jackass is credited with finding the first Galena ore in 1884) founder of The Bunker Hill Mine, once one of the largest employers in the region. Headquarter buildings are now converted into hostels and are popular for travelers interested in modest accommodations. In 1886 Kellogg was linked by rail to the Coeur d'Alene River at Cataldo where steamboats carried supplies from Coeur d'Alene and minerals to connections in Spokane. With the completion of the Veterans Memorial Centennial Bridge in 1992, the trip from Coeur d'Alene to Kellogg by auto is less than 30 minutes. The discovery of gold and silver coincided w with the completion of the Northern Pacific Railroad, which connected Lake Superior to the Puget Sound. By 1915 Coeur d'Alene had shipping facilities on five transcontinental railroads, plus an interurban electric railroad that maintained hourly transportation between Spokane, WA and Coeur d'Alene. A fleet of steamboats offered tourist excursions as an extension to rail access to Spokane and the Northwest. 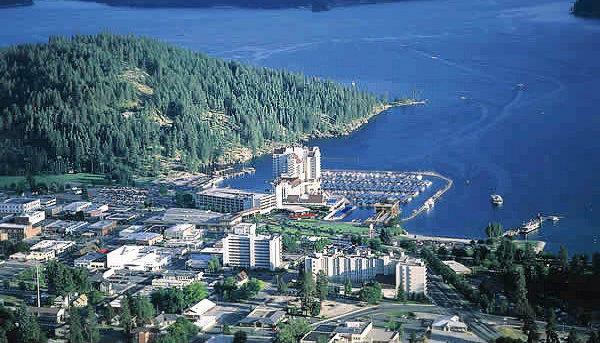 By 1910 Coeur d'Alene was known as the convention city of Idaho. Originally named Westwood, in 1881 Rathdrum was renamed after a town in Ireland in order to obtain it's own post office. 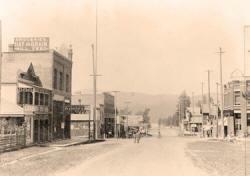 It was county seat of Kootenai County until 1908. It was the end of the Northern Pacific Railroad route to the Coeur d'Alene Mining district. From here, miners took a stage to Coeur d'Alene and a steamboat to Cataldo. In 1886 a branch line to Hauser re-routed traffic. Several of Rathdrum's historic buildings reflect its prosperous days as the county seat. At one time a rough-and-tumble logging town, Harrison still sports remnants of its colorful past. Historic buildings, like the community's two churches, weathered saloons and even the city's cemetery, all stand as testament to the hardy souls who built this one-time boom town. 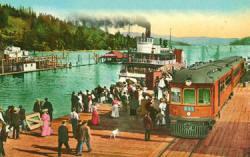 In the early 1900s, Harrison was a main port for the big passenger steamers that navigated Lake Coeur d'Alene. Bonners Ferry was named for Edwin Bonner. He was the builder of the first ferry boat on the Kootenai River that was used for transportation needs of gold prospectors of Wild Horse Creek in British Columbia. The Kootenai River, which flows through Bonners Ferry is a fickle patriot. Originating in Canada, it flows South across the U.S. border then returns North back into Canada eventually emptying into the Snake River. It is also unique in that it once contained a large sturgeon population, which is now being rebuilt by the Kootenai Tribe. St. Maries developed as a steam-boat stop and major distribution center for raw logs, at the confluence of the St. Maries and St. Joe rivers. 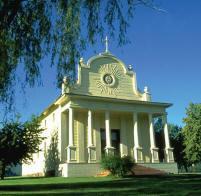 Named by Father Pierre DeSmet, who built the original mission on the St. Joe just north of town. Flooding forced the priest to move the mission to Cataldo, where it stands today as the oldest original building in the state. In St. Maries timber industry involvement continues. Boats maneuvering large brailles of logs to sawmills can still be seen moving along the St. Joe River. St. Maries is the home of Vernon Baker, the first African American awarded the Congressional Medal of Honor. Prior to 1846, Native Americans inhabited the shores of Hayden Lake. Legend has it that in 1878 a pioneer named Matt Heyden and another early homesteader, John Hager got into a poker game to see who would name the lake. Heyden won, although time altered the spelling to Hayden Lake. The Hayden Lake Country Club was once a recreational stop on the area's electric railroad known as Bozanta Tavern. During World War II it was an R & R site for service personnel. The village of Bayview was once the terminus for lake steamers bringing lumber and lime from other points on the lake. After the start of World War II Farragut Naval Training Center was built just west of Bayview. The second largest training center in the country, it processed 293,381 sailors in one 15-month period. After the war the center was decommissioned and given to the state of Idaho for a state park. Bayview is currently the site of a US Naval underwater research facility. Frederick Post came upon a falls in the Spokane River in 1871 and visualized the ideal location for a sawmill. He negotiated a treaty with Chief Andrew Seltice of the Coeur d'Alene Tribe and started the area's first commercial sawmill in 1880. The settlement of Post Falls grew up around the mill. 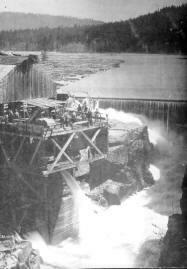 The dam is now operated by Avista Utilities and is the site of Falls Park, with observation decks open to the public. The Coeur d'Alenes and much of northern Idaho had immense stands of white pine and met all the conditions for logging, including transcontinental railroads to take the lumber to market. 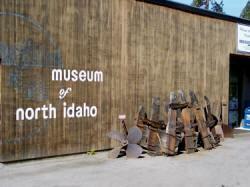 Many of the towns in northern Idaho began as logging centers. Priest Lake is named from the legend of a priest, ministering to early settlers, who disappeared one winter and was presumed drowned in the cold, clear waters. The lake is also famed for being the site of several early silent movies produced by Nell Shipman in the 1920s. The city of Sandpoint is named for the extensive sandy beach area that extends into Lake Pend Oreille near downtown. Lake Pend Oreille (pronounced Pond -O -ray) is said to have been named by French fur trappers who thought the lake was shaped like a large ear. The lake is over 43 miles long, six miles wide and its depth is more than 1,200 feet. Early trapper, David Thompson who worked for The Hudson Bay Company, was responsible for charting maps for much of North Idaho as well as building a trading post east of Sandpoint near Hope, Idaho, called the Kalispel House. Idaho's oldest standing building - Cataldo. 2. The gold mining town of Murray. 3. The city of Historic Wallace. Old Mission State Park - One mile E of Cataldo off I-90 682-3814 Cataldo Mission of The Sacred Heart at Old Mission Park is the oldest standing building in Idaho. Staff House Museum - 820 Mckinley 786-4141 in Kellogg displays the history of Bunker Hill Mine. Vintage Wheel Museum - 218 Cedar St in Sandpoint exhibits antique cars, horse drawn vehicles, steam engines and logging equipment. The City of Hayden, adjacent to the City of Hayden Lake, provides the area with complete shopping facilities and the local elementary schools, library and firehouse. The Coeur d’Alene Airport, which easily accommodates commercial jet aircraft, is located within the boundaries of Hayden. Several major corporations have located their corporate headquarters at this airport. GOLF: Within five to thirty minutes the golfer has access to twenty one golf courses --- some world class. SKIING: There are six major ski resorts all within forty five minutes to one and a half hours of Hayden and Hayden Lake. SNOWMOBILING: The visitor has access to hundreds of miles of groomed trails in the National Forest. BIKING: Class one, two and three trails make travel easy and accessible in all directions. CAMPING, HIKING AND HUNTING: The mountains and forests offer everything for the outdoor adventurer. CULTURE: The access to concerts, symphonies, plays, arts and crafts are abundant to the Hayden and Hayden Lake communities. contact the Hayden Chamber of Commerce! Post Falls is located four miles east of the Washington-Idaho border along Interstate 90 in Kootenai County and is bounded by Coeur d’Alene, Idaho to the east, the State of Washington to the west, the Spokane River to the south and the Rathdrum prairie to the north. Post Falls is 20 miles east of Spokane, Washington and approximately 100 miles south of the Canadian border. The City of Post Falls has grown from 7,350 residents in 1990 to an estimated 23,992 in 2007. Growth is expected to continue at a rate of 3.5% with the population reaching nearly 65,000 in 2028. This influx of new residents has resulted in a strong construction industry, with total building permit valuations in the City exceeding $33,000,000 for the past eight years. Since 2002 the valuations have equaled $484,021,850. Valuations of permits totaled $151,903,993 in 2005 and $90,456.182 in 2006. They are expected to continue at a high level for FY 07. Total net taxable market value in Post Falls is $1,741,519,684. Due to the proximity of numerous lakes, rivers and mountains, Post Falls, Idaho is an inviting place to live and visit. This fact is reflected in the tourism and retail sectors of the economy, with an increasing number of retail, dining and entertainment businesses locating in the City. Additionally, Post Falls has become a favored retirement community as well as a great place to raise a family. Kootenai County traditionally has had a timber-based economy. That is changing gradually, as the manufacturing base has become more diverse. Manufacturing jobs are found primarily in electronics, lumber and furniture at the present. Jobs Plus, Inc., the local economic development organization has recruited a number of firms to the county. Post Falls was the chosen location for Flexcel, Inc., a major furniture manufacturer that relocated to north Idaho and employs a workforce of 440. This was done with the help of Jobs Plus and by creating an Urban Renewal District to help build infrastructure. This District closed out at the end of December 2001 and was the first urban renewal district in the state to complete approved projects and close. Jobs Plus, Inc. also helped bring Center Partners, a call center business (employing a workforce of 300), and Buck Knives who brought their manufacturing headquarters (workforce of 250) to the City. Also, Wal-Mart opened its new store in January of 2002, employing a workforce of 300. Construction of Northwest Specialty Hospital, a private surgical hospital, was completed in 2004 and North Idaho Advanced Care Rehabilitation Hospital is a recent addition to our city. Life Care is constructing a senior housing and care facility in 2007. Sysco Food Services opened their distribution plant during 2005. This project was made possible by Jobs Plus, Urban Renewal, and the City working together. Biopol, a high tech medical research firm will also locate to Post Falls in 2007. They will research and create allergy vaccines in the Riverbend Commerce Park. Also, a community development block grant for $500,000 was used to help fund a water tower (approximately $1,500,000 total cost) that was needed on the west side of town for development in that area. The West Post Falls Urban Renewal District will see the addition of Cabela’s and 800,000 sq. ft. of additional retail space developed in 2007. 2,150 Feet above sea level. Post Falls has four distinct seasons. Summer, Winter, Spring and Fall, with temperatures ranging in the 90's midsummer and low teens during the Winter. Post Falls averages 29 inches of rain and 49 inches of snow. Post Falls is served by I-90, which extends east and west of the panhandle of Idaho through Post Falls. Post Falls is located approximately two miles east of the junction of State Highway 41, which extends approximately 8 miles to Rathdrum Idaho. Post Falls is approximately 7 miles west of State Highway 95 which extends the length of Idaho to Canada. Post Falls is named for Frederick Post, a German immigrant, who constructed a lumber mill along the Spokane River in 1871 on land he purchased from Andrew Seltice, Chief of the Coeur d’Alene tribe. The purchase of the land is preserved in a pictograph on a granite cliff in Treaty Rock park. We have made every effort to make sure the information at this site is correct. However, in the event that any information on this site is incorrect, we assume no liability for damages incurred directly or indirectly as a result of incomplete, incorrect or omissions of information. In addition we shall have no liability for the content or any errors or omissions in the information provided on linked websites and the content of websites that are linked from this web page.